The week I decided to 'go vegan' ended up with me curled up in a fetal position, hungry and angry all the time. Alas, going vegan was not for me - though I to go meat-free every once in awhile and being lactose-intolerant means dairy only when ice cream beckons. Which is actually more often than you think. SO! When the nice folks at LUSH released a vegan shampoo and conditioner, I thought I could give this a go. I don't have to eat it and is cruelty-free. 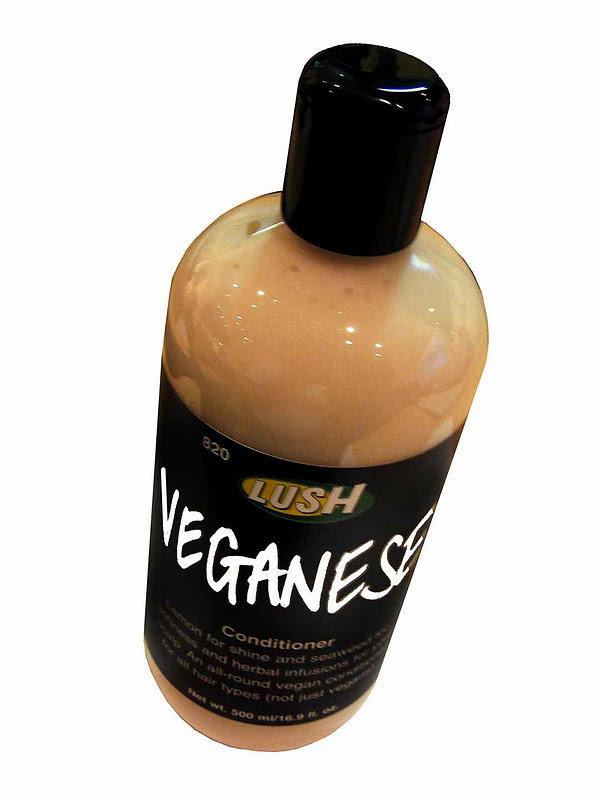 Incidentally enough, LUSH products are 100% vegetarian and 81% vegan. Rehab Shampoo ($13.95 3.3 oz./ $24.95 8.4 oz) smells fresh and fruity with a mix of organic pineapple and kiwi juices with a lavender undertone. Jojoba, olive and almond oils are added to restore hair’s strength and flexibility. 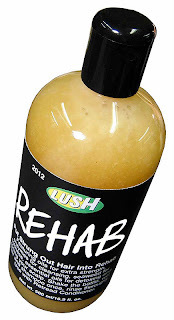 The shampoo itself comes out quite thick, so you don't need a lot to get a good lather going. I loved the smell and it did a good job cleansing my hair. This light conditioner has a softening agar seaweed gel base (instead of sheep’s wool derived Lanolin) and fresh organic lemon juice for shine. I need a pretty strong conditioner because my hair is so thick and had to use a lot to get a good condition-thru. This probably wasn't the right formula for me and would work better on someone with fine hair.